It's Academy Awards night and we'll be watching. I know, I know...in this dire economic environment, isn't there something less shallow and less celebrity oriented to write about? We consider ourselves movie people. We would rather watch a movie than broadcast TV. So naturally we've got our thoughts on which of the latest movies should get recognized. But never mind predictions on who's going to win, there is a more interesting business story buried in the celebrity media buzz. "The ABC network, in a move that reverses years of escalating prices and underscores the worsening economy, has shaved the cost of a commercial for Sunday's annual Academy Awards show, one of TV's most-watched programs. Once considered invincible to downturns, big events such as the Academy Awards and the Super Bowl, which attract tens of millions of viewers, can no longer command automatic rate hikes." Hmmm...it appears that a decline in viewership has been ongoing since 2001, including a resurgence in viewers in 2003 and 2004. All non-recession years. However, there were dips in recession years - 1981, 1987 and 1997. I bet that ABC would find that its ad revenues from those years' Academy events would have been even lower, much like this year's. So what's causing the dip in viewership if the point of origin isn't the recession? The Associated Press via the Huffington Post say: "The worst-kept secret in Hollywood this awards season has been how first-time producers Laurence Mark and Bill Condon, in a bid to build buzz and bounce back from last year's ratings nadir, are keeping their Oscars overhaul plans a secret....The academy has a problem here. The show is way too long, and the films this year are not spectacular he said. If this year's ratings are down, it could be the tipping point and they will have to make changes." I don't know if I agree...with the assertion that this year's crop of movies is not spectacular. 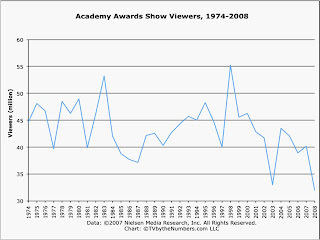 I do agree that it may be a tipping point moment for the Academy Awards. But it really doesn't matter. Thanks to the global economic crisis efforts to reinvent the program through format changes such as new hosts and the elimination of monologues may not make a difference. Maybe people are too beaten down by the economy to watch red carpet questions about the latest over the top jewellery or fashion designers. Maybe they'll watch a pay per view movie or DVD instead!